Urethane Dunnage Parts ? You’ve come to the right source! Urethane Dunnage Bars: Urethane Dunnage Bars are a popular choice when searching to protect equipment being shipped or general storage. Urethane Dunnage Bars are manufactured to provide maximum cushioning protection for parts during transport on production lines or in shipping. Custom cast urethane dunnage bars provide vibration and shock protection for delicate parts to keep awkwardly shaped parts from shifting during transport. 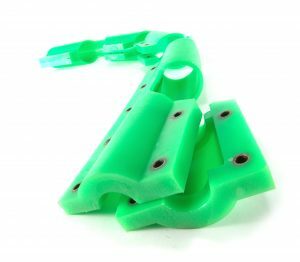 Custom Molded Urethane Dunnage: Custom Molded Urethane Dunnage parts have been manufactured at Plan Tech for over 30years! Plan Tech will calculate and recommend the correct mechanical properties to protect the most delicate components to large construction equipment. From prototype to high volume our sales team of engineers will work on every detail for truly custom molded urethane dunnage parts for any profile on any application. Urethane Dunnage Equipment: Urethane dunnage equipment is an ideal choice when shipping delicate parts. Urethane is non-marking and has excellent physical properties to absorb an impact and return to its original shape even after years of heavy abuse. Typically supplied with a 60A hardness urethane dunnage equipment can be easily molded to match the profile of what needs to be protected. Urethane offers great vibration protection and well as great shock protection for delicate parts. We can help you design a custom urethane part to allow for the maximum number of dunnage parts to be safely transported using the minimum amount of material. Urethane can be molded to fit even the most intricate parts. Plan Tech uses the highest quality polyurethane material from world leading chemical suppliers to produce urethane dunnage with excellent physical properties for the most demanding applications. 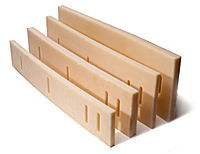 High wear and abuse dunnage parts are available in any size and configuration with mold making capabilities on site. While most polyurethane dunnage is soft, high impact polyurethane dunnage is also very popular commonly replacing UHMW and similar material. If you need for protection of delicate parts Plan Tech can custom manufacture dunnage parts for your application! For over 30 years we have focused on using speed and precision to manufacture the highest quality industrial cast polyurethane components to our customers. A particular strength is the breadth of our in-house capabilities such as polyurethane compression molding and grinding urethane parts which, when combined with our extensive experience, enables us to deliver tight tolerance parts while maintaining the quality control and cost effectiveness our customers require. Whether you are a start-up company or global leader, we can add value to your products with our strong engineering support, urethane polymer experience and constant focus on meeting all delivery requirements. Our rapid prototyping capabilities have also received particularly positive feedback – we frequently go from “Print to Part” in 10-15 business days! Everything we manufacture is MADE IN THE USA! Plan Tech has an outstanding team of dedicated employees with exceptional talents designing and manufacturing polyurethane molded parts. We also are very proud of the “company we keep.” Our customers include many Fortune 500 companies, most of whom have been customers for 20+ years. Their drive to become industry leaders has helped us do the same. Please Contact us for further details regarding your custom dunnage application!